Mayor-elect Bill de Blasio ran on a platform with ambitious goals to reduce traffic deaths, improve bus service, increase bicycling, and make the city more affordable. As New York City’s first mayoral transition in 12 years gets underway, Streetsblog is asking advocates and experts how Mayor-elect de Blasio should follow through and implement a progressive transportation policy agenda. Today’s post comes from Rachel Weinberger, director of research and policy strategy at Nelson\Nygaard Consulting Associates. On a trip to Guangzhou, China, I saw hundreds of unused parking spaces — built because they are required, viewed by developers as the “cost of development.” They are unused because walking, bus rapid transit and subway alternatives are better — much like similarly overbuilt parking facilities at New York’s own East River Plaza, Barclays Center, and Yankee Stadium. In Guangzhou, the waste is even more profound because street capacity is maxed out. The parking requirements relate to the building size, not the street capacity, and as it stands you could barely get another car on those streets, let alone enough to fill those spaces. In London, by contrast, city leaders have grasped the nuance that more parking equals more driving — something we once knew in New York City. While New York is far ahead of many cities, there is still plenty wrong with how NYC thinks about, grows, and manages its parking supply. There are two quick things the new mayor can do with parking policy to improve quality of life and social equity and to make the city a better place. A minimum parking requirement for development, as a way to ease otherwise constrained parking, is the most commonly adopted and most misguided parking policy the world has ever embraced. In NYC, the dissonance between this policy’s intentions and its on-the-ground effects reaches grotesque proportions. And few cities have more to lose from policies so indifferent to the value of real estate, and with such unwanted impacts on housing costs. In NYC, like Guangzhou, we tell developers the minimum number of spaces they must provide if they want to build in our town. We do this in spite of the fact that there is no scientific or engineering rationale for the numbers we dictate — we tie those numbers to building size and we fail to consider the street capacity. We do this in spite of the overwhelming evidence that more parking leads to more driving. We do this despite the fact that requiring off-street parking drives up the cost of development easily adding 15 percent to costs, which in turn results in less and more expensive housing and fewer jobs. Imagine this: dropping minimum parking requirements could net a 15 percent increase in housing in neighborhoods where the city requires one space per unit. Furthermore, the evidence shows that the cost burden of over-required parking falls disproportionately on lower income households. In one example, a development aimed at providing housing for households with incomes below $44,000 a year was required to include one space for every 2.3 units. In the end they only saw demand for one space for every five to six units. The result was over $400,000 of investment in unwanted parking, not to mention the opportunity cost of wasted space that could have been used to build more units. Housing, more than parking, is something for which NYC has a constant need. Since there is no compelling public health, safety, or welfare reason for requiring developers to provide off-street parking, and there is ample and increasing evidence that parking may, in fact, undermine public health safety and welfare, it remains a mystery to me that cities continue to set such requirements. Indeed, many European and U.S. cities have either eliminated minimums or lowered them to nominal levels coupled with maximum parking levels. Rather than deciding how much space to require, these cities are deciding how much to allow. Major London developments are built with few or no parking spaces at all. But they got the idea from us. 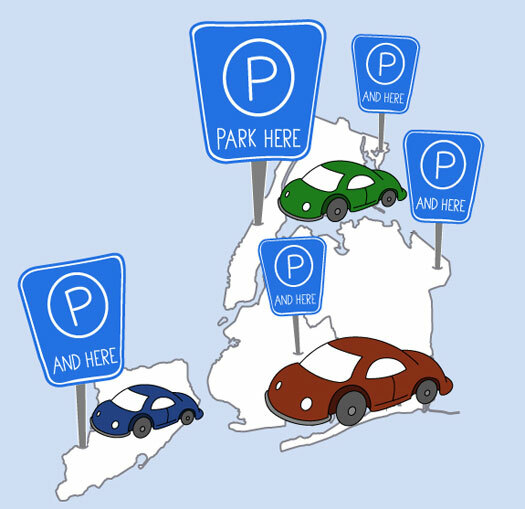 New York City was an early adopter of parking maximums for most of Manhattan. In the 1980s, our city leaders recognized the health and traffic reduction value of limiting parking. The rest of the city deserves equal consideration. Searching for parking has been estimated to generate nearly half the traffic on some NYC blocks. Clearly this is a waste of time, fuel, and nerves, and constitutes an unnecessary burden on buses and passing traffic. People hunt for a free or metered space because it pays to do so. To the extent that off-street parking is more expensive, underpriced on-street parking will create an incentive to use local streets to queue up for a better deal. The behavior this pricing inspires is often perfectly rational. If two hours of off-street parking costs $12 (typical in Jackson Heights) or $35 (typical in Midtown) a driver might decide to spend 15 minutes looking for a space instead of pulling into a garage. For 15 minutes, that person saved $12 or $35 — in either case it’s a pretty nice return on investment. To reduce or eliminate this excess travel, the city has to make sure that driving around looking for a space is not such a good deal. Seattle, San Francisco, Mexico City, and a host of other cities around the world have set availability standards for their curbs. They set prices that make sure spaces are available and that don’t reward drivers for driving around and around hoping to save on a garage. With PARK Smart, NYC has made incremental steps in the same direction. It’s time to pick up the pace. Ironically, we pay our rent and mortgages — grudgingly, perhaps — but nevertheless we expect our cars to park rent-free. Whether or not to own a car in New York City should be a true choice. But the mayor must recognize that this choice is not made in isolation. Mobility options are complements to density and land use mix; when a New Yorker decides to live in a low-density part of the city that New Yorker may also decide that a car is key to getting around. If a New Yorker decides to live in a high-density area, a car may not be needed. Facilitating car ownership by making parking cheap or free throughout the city undermines those parts of the city where transit and walking work best. This distorts choices and is a disservice to the city. If there are high-density neighborhoods that are poorly served by transit, the city’s best option is to improve transit. Only by improving transit can we improve conditions for drivers. Any attempts to directly improve conditions for car use will be met with greater car dependence and more cars. A spokesman for AAA recently said that New York City is “under-carred.” He implied that government should “fix it” so we can have as many cars as other Americans do. What he didn’t mention is that if you did what he suggests, it would take the space of 100 Empire State Buildings to park those cars. And, like Guangzhou, we would find most of those spaces empty, either passed over for more sensible mobility options, or made unreachable by the “car-friendly” policies that will inevitable grind our local streets to a halt. Mayor de Blasio can reduce traffic and traffic fatalities, increase housing, reduce the cost of development, and see better health outcomes if he improves parking policies throughout New York City. Really? Have you heard of NIMBYs? Current residents who park on-street prefer that new developments have private off-street parking. Of course, new residents aren’t required to use that parking, so many up competing for free spots anyway. The photograph is a grotesque parody of all the Dutch “before and after” photos. I mean the photos that show how car-choked the landscape was in the 1960’s, and how human friendly it is today. Instead we see just the opposite. Bizarre. The root cause seems to be that in Europe, governments believe in free enterprise and free market capitalism. But in the USA, governments believe in government socialism for car drivers. The solution is simple: Let free markets rule, like they do in Europe. When car drivers have to pay the true costs of their habit, there will be a lot less car driving. That’s a big reason, yes. Actual residents are scared that more residents will make it harder to find parking spots on-street. So they have a knee-jerk reaction to modifications to zoning making less off-street places available. In Japan, the solution was simple: on-street parking is almost inexistent, if people want to have parking, they need to build it on their own land or buy spots at private off-street parking lots. Of course, if you mandate high off-street parking spots, that solution still means nothing, but they tend to not have as many parking spots as we do. But in North America, on-street parking is often seen by urbanists as a traffic-calming measure to counteract the fact that roads are very wide. Which creates the NIMBY dynamic you described. Personally, I find the Japanese solution much more elegant. At least you don’t have these eyesores everywhere you look, dozens of cars parked in unbroken lines along both sides of the street. Parked cars that make it very scary for cyclists in many places, as they never know when a door is going to open and cars in movement force them to hug close to the parked cars where they can hit side mirror if they’re not careful. Park Smart is a very narrow program that will do little to curb cruising for parking. Relatively little cruising is devoted to finding cheap temporary on-street parking. These drivers are looking for free long-term (multi-day) parking. Eliminating parking minimums will help, but changes due to new development come very slowly. What we really need, as I’ve advocated on my blog, is to put a price on residential side-street parking, with NO time limits beyond the implicit time limit due to street cleaning. I totally agree here. On-street parking is ugly, plus vehicles parallel parking create yet another hazard. On top of that, you have all that wasted space. It’s important to remember here in NYC it was illegal to store your vehicle overnight on public streets until the 1950s. We need to mention this little fact whenever NIMBYs complain about eliminating parking. What the government gives it can also take away. We can start by daylighting all intersections. Don’t allow parking within 75 feet of the corner, and build curb extensions to enforce that. The bulk of the remaining spots should be allocated to loading zones, especially in commercial areas. If parking is that important, then people will have to pay the cost of off-street parking. The hard truth is many car owners couldn’t afford to, so they would just end up selling their vehicles. We’ll all be better off if greater numbers opted to go car-free. Right. You can’t wish that away. New buildings mean more cars competing for on-street parking with existing parkers. Unless they are convinced the buildings will not take away “their” spaces they oppose the buildings. The solution, as I noted, is permit parking for the overnight hours, with a maximum number of permits issued and existing motor vehicle owners grandfathered in with a permanently modest fee. With the supply of permits fixed, new residents would simply be unable to park overnight in on the street in the neighborhood. If they chose to move to new housing without spaces, it would be with that understanding. If the NIMBYs are met halfway, something might get done. Another change of note was in Windsor Terrace, where off street parking spaces were banned for one- and two-family homes. Why? The curb cuts would take away parking, and then the garage would fill with crap and the owner would end up competing for the diminished number of competing spaces. I don’t know if I would call European transportation economics “free market” so much as state capitalism. The systems are more or less expected to pay for themselves, at least moreso than the Amercan system, but they are still owned and/or heavily regulated by the state. Deutsche Bahn is operated as a profitable, state-owned company. The New York Times just had an article about Germany being in a bind because its infrastructure investment has dropped so much over the past 20 years of economic liberalization (=more “free market”). The Park Smart site says: The meter rate is higher when demand for parking is greatest and decreases when demand is lower. Sounds like a good solution to me: increase the price so that the demand drops. I think you hit the nail right on the head there. That explains the NIMBY angle well. Park Smart is only being applied in commercial areas for short term parking. The vast majority of parking in NYC is residential and long term. On-street parking is great for short-term visits, shopping, etc… and even then, that doesn’t work in places like Manhattan where there’s too many people for it to make sense. In Manhattan, the only thing on-street parking is good for is loading zones. And it probably should be again. The main useful uses of on-street parking are emphaticaly not overnight.